Back at the home AO again on this chilly Valentine’s day. YHC doesn’t normally care much for Valentine’s day, but a recent Bible verse made him reconsider… more later in the Devotional. It was good to see the one and only House again! Back in town from KC, this #HIM was ready to make his #downPAINment in the friendly confines of RBHS’ Pellet Palace. #TClaps to #TwitterLess Spackle for bringing House with him to the workout this morning. Our normal mumble chatter box Spackle is feeling under the weather, and it was apparent. A #HIM puts others before himself, and this morning was a fine example. Feel better, brother. #TClaps to Graveyard’s AOQ, Shades of Grey for helping YHC construct the lighted neon cones in just the right places, in order to create our Strava Art for this morning’s workout. Thank you sir! Mosey to far side of concourse in front of press box, head down stairs to field and circle up at the 50. Merkins 50 OYO – it is still the goal of YHC to hit 50 good form merkins without stopping. 47 today. #TClaps to SoG for hitting all 50! Strong!! 13 – Run the “M” — this was meant to be a sort of agility drill. 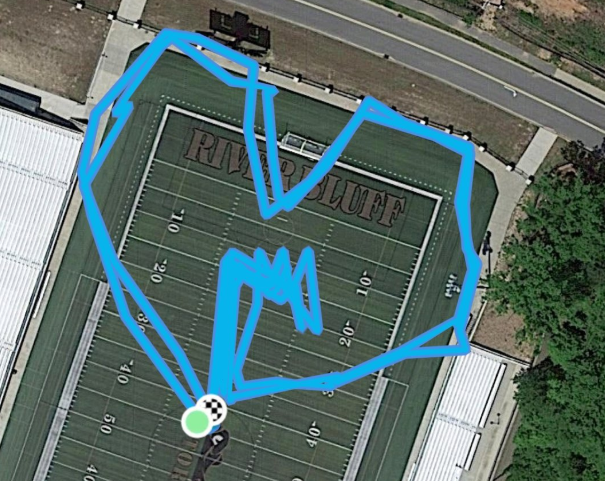 But YHC also wanted the “M” in his Strava art! Each station was done AMRAP for 55 seconds, then PAX mosey’d to the next one. The focus was shoulders, legs, and core. The PAX got through 2 rounds, before time was called. Solid work, gents! DamToDam Relay this weekend, 2/16. Ask Paperjam or Juice for volunteering opportunities. So we’ve all heard the above scriptures countless times. The verse from Paul is commonly read at weddings. As YHC thought about his lack of caring about Valentine’s day, a thought occurred. We are called by God to love others. He tells us what love looks like. So the challenge this day, and every day, is to love others as He’s outlined before us. Love isn’t boastful, nor proud. It is not judgmental nor faithless. Behind the Lord, our M’s should be the number one priority in our list of those to love on. We put the M in our hearts symbolically this morning, but it needs to be in action, as well. Don’t let YHC fool you, this is a struggle for him, too. Every day is a new day, though. YHC will do better today than yesterday. Love shouldn’t be limited to our M’s and 2.0’s. We should love God and ALL of His creations. Some days that is easier than others. A great example of love and consideration came from none other than Spackle this morning. He felt pretty bad, and it was apparent from his lack of usual chatter and the way he was carrying himself. But his buddy was in town from KC, and he wanted to post with him. Now, maybe YHC is giving Spackle too much credit, and House was the one who EH’d Spackle. We may never know. YHC isn’t sure if Spackle’s fax machine can handle this many letters, but YHC would like to think it was the other way round!